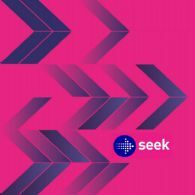 SEEK&apos;s (ASX:SEK) (OTCMKTS:SKLTY) job ad data shows that 2018 was a strong year for the Australian employment market with new job ads up 8.6 per cent over the 12 months and in more good news for jobseekers, across all industries the average advertised salary up by 3.9 per cent. SEEK Limited (ASX:SEK) (OTCMKTS:SKLTY) today announced the successful refinancing of its syndicated loan facility arranged by HSBC and National Australia Bank comprising revolving facilities of A$625m and US$275m, and two new term loans totalling US$300m. 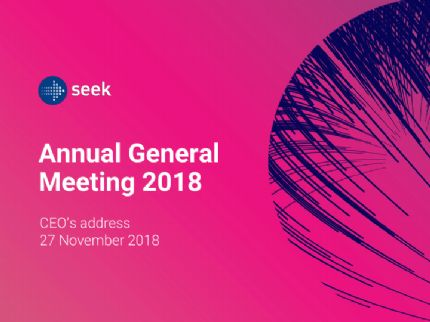 SEEK Limited (ASX:SEK) AGM - Chairman&apos;s address to Shareholders - Fellow shareholders, it is my pleasure to address you today and provide some of the highlights of the past financial year. 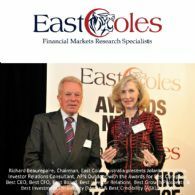 SEEK Limited (ASX:SEK) (OTCMKTS:SKLTY) provides the Company&apos;s 2018 Annual Report. 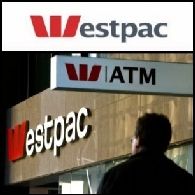 New SEEK (ASX:SEK) (OTCMKTS:SKLTY) data shares the latest employment trends across Australia, revealing that within the Banking and Finance sector, adverts for Compliance and Risk job roles have increased by 122% in the last five years, with a dramatic 48% increase in the last year alone. Currently 13.5% (as of October 2018) of Banking and Finance roles on SEEK are in Compliance and Risk. SEEK (ASX:SEK) (OTCMKTS:SKLTY) today confirms that its Chairman Neil Chatfield will retire on 31 December 2018. Neil&apos;s retirement was first advised to shareholders at SEEK&apos;s 2017 AGM. As part of the SEEK Board&apos;s ongoing renewal and succession process, the Board is pleased to announce that Graham Goldsmith will become SEEK&apos;s next Chairman. SEEK Limited (ASX:SEK) (OTCMKTS:SKLTY) provides the Company&apos;s FY18 Full Year Results. In its FY18 results, SEEK Limited (ASX:SEK) (OTCMKTS:SKLTY) will recognise the net impact of three key significant items of A$142m. To align with previously announced organisational structure changes, SEEK (ASX:SEK) (OTCMKTS:SKLTY) has made a series of changes to its financial reporting structure. SEEK Limited (ASX:SEK) (OTCMKTS:SKLTY) provides the Company&apos;s latest presentation at Macquarie Australia Conference. 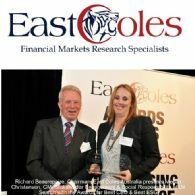 SEEK Limited (ASX:SEK) (OTCMKTS:SKLTY) announces that Colin Carter has retired from the Board with effect from today. SEEK Limited (ASX:SEK) (OTCMKTS:SKLTY) is today announcing that it has entered into a binding agreement to increase its ownership in SEEK Asia from 86.25% to 100% by acquiring the remaining 13.75% of shares from News Corporation. SEEK Limited (ASX:SEK) (OTCMKTS:SKLTY) announced its results for 6 months ended 31 December 2017. 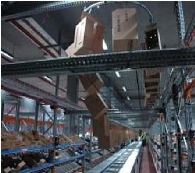 SEEK Limited (ASX:SEK) (OTCMKTS:SKLTY) is today announcing key organisational changes to take advantage of long term growth opportunities. There are two key changes. New Zealand&apos;s increasing need for social services has seen jobs in the Community Services & Development industry among the fastest growing on SEEK (ASX:SEK) (OTCMKTS:SKLTY) for 2017. SEEK Limited (ASX:SEK) (OTCMKTS:SKLTY) advises that Zhaopin Limited (NYSE:ZPIN), its New York Stock Exchange listed subsidiary, announced on 17 August, 2017 that it has lodged a transaction statement on Schedule 13E-3, with proxy statement attached as an exhibit, with the U.S. Securities and Exchange Commission and has called an Extraordinary General Meeting of shareholders to be held on 25 September, 2017. SEEK Limited (ASX:SEK) (OTCMKTS:SKLTY) announced its results for 12 months ended 30 June 2017. Today SEEK (ASX:SEK) (OTCMKTS:SKLTY) announced that it has entered into an agreement for lease to relocate its head office in 2020-2021 to a purpose build premises to be constructed at 60 Cremorne Street, Cremorne, Melbourne Australia. 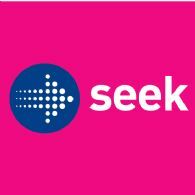 SEEK (ASX:SEK) (OTCMKTS:SKLTY), Australia&apos;s number one jobs, employment and career marketplace has strengthened its mobile offering with the launch of a new solution that transforms the way people apply for jobs on-the-go. SEEK Limited (ASX:SEK) (OTCMKTS:SKLTY) today announced the successful refinancing of its syndicated loan facility and an increased limit of cA$910m (comprising A$550m and US$275m) from the previous limit of cA$880m. 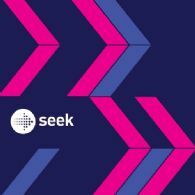 The latest SEEK Limited (ASX:SEK) (OTCMKTS:SKLTY) data has revealed there were 8.5 per cent new job ads on SEEK this May than 12 months ago. 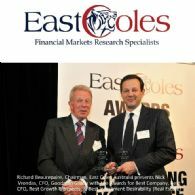 Andrew Bassat, CEO and Co-Founder, SEEK and Richard Murray, Group CEO, JB Hi-Fi Limited were winners of inaugural Workplace Giving Excellence (WPG) Awards in 2016. The Awards, an important part of the One Million Donors campaign to grow WPG, celebrated those employers who enable staff to donate to charity direct from their pay. 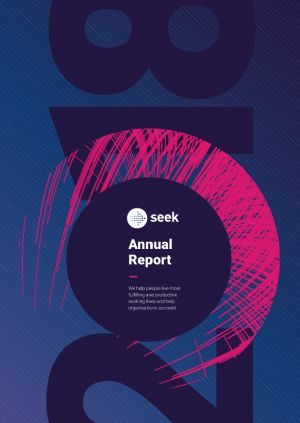 The latest SEEK (ASX:SEK) (OTCMKTS:SKLTY) data has revealed there were 9.7 per cent new job ads on SEEK this April than the same period last year. 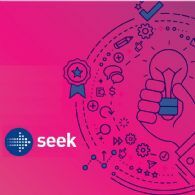 The latest SEEK Limited (ASX:SEK) (OTCMKTS:SKLTY) data has revealed there were 6.6 per cent new job ads on SEEK this April than 12 months ago. Michael Ilczynski, Managing Director for SEEK Australia and New Zealand, confirmed at a national level the Mining, Resources & Energy sector enjoyed the largest advertising growth of all industries on SEEK this April, up 55 per cent year on year [y/y]. SEEK Limited (ASX:SEK) (OTCMKTS:SKLTY) is pleased to provide the Company&apos;s latest presentation at Macquarie Australia Conference. Perform Zone, the cloud computing company that helps relationship-driven organizations transform their businesses, today announced that it has upgrade their partnership with SEEK - Australia&apos;s number one jobs site - to develop a seamless, closed-loop integration between the SEEK job portal and Perform Zone ATS/CRM, available as part of Perform Zones recruitment software effective immediately. SEEK Limited (ASX:SEK) (OTCMKTS:SKLTY) is pleased to announce that it will issue A$175m of 5 year A$ Floating Rate Notes with a coupon of 3 month BBSW + 2.30%. The proceeds from the Notes will be used for general corporate purposes including to repay SEEK&apos;s existing bank debt. SEEK Limited (ASX:SEK) (OTCMKTS:SKLTY) advises that Zhaopin Limited (NYSE:ZPIN), its New York Stock Exchange listed subsidiary, announced on April 6, 2017 that it has entered into a definitive agreement and plan of merger. Today, SEEK Limited (ASX:SEK) (OTCMKTS:SKLTY) announced that it has entered into binding agreements to increase its ownership interest in OES; a joint venture between SEEK and Swinburne University of Technology, from 50% to 80% by acquiring shares in OES from Swinburne. SEEK Limited (ASX:SEK) (OTCMKTS:SKLTY) ("SEEK") announces that it has signed documentation for the establishment of a Euro Medium Term Note Programme ("Programme"), and has appointed HSBC as Global Co-ordinator to undertake a non-deal roadshow. SEEK Limited (ASX:SEK) (OTCMKTS:SKLTY) today announced that Vanessa Wallace has been appointed to the Board as a non-executive Director, effective from 1 March 2017. SEEK Limited (ASX:SEK) (OTCMKTS:SKLTY) is pleased to provide the Company&apos;s FY17 Half Year Results Presentation. SEEK Limited (ASX:SEK) (OTCMKTS:SKLTY) provides Zhaopin (NYSE:ZPIN) transaction update, delivers strong results in ANZ and China alongside reinvestment to support growth aspirations. SEEK Limited (ASX:SEK) (OTCMKTS:SKLTY) advises that Zhaopin Ltd (NYSE:ZPIN), its New York Stock Exchange listed subsidiary, has today provided an update in relation to a potential transaction (copy attached). 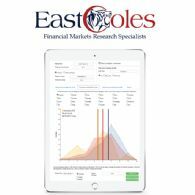 The Australian share market closed lower yesterday despite a positive lead from US markets and the United States central bank&apos;s rescue of global insurer American International Group (AIG). Overnight Wall Street plunged more than 4% after the US Federal Reserve has announced it would provide AIG with an $US85 billion rescue loan to save it from bankruptcy. 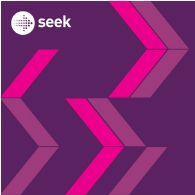 Seek Limited (ASX: SEK) - 2007 Seek Employment Satisfaction & Motivation Survey - Mr Joe Powell, Sales Director; Seek Limited (ASX: SEK) present the following audio webcast regarding "2007 Seek Employment Satisfaction & Motivation Survey". 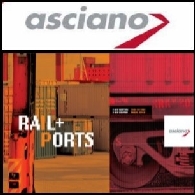 You may also download this audio webcast to your computer or portable audio player. 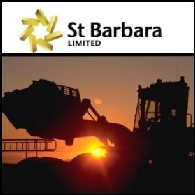 Seek Limited (ASX: SEK) - Full Year Results for 2006 - Mr Andrew Bassat and Mr Paul Bassat, Joint CEO; Boardroomradio is pleased to announce that Seek Limited (ASX: SEK) has published an audio file.